Egyptians triumphed over their police state without Western help or even moral support. Commentators have repeatedly referred to the Obama administration playing catch-up during the Egyptian revolution, yet its seeming inability to track fast-changing events was merely an expression of its unwillingness to embrace the direction those events were heading. Immediately after Hosni Mubarak resigned, Jake Tapper from ABC News tweeted that he couldn’t find anyone in the administration who thought that whatever comes next would be better for U.S. interests than Mubarak had been. 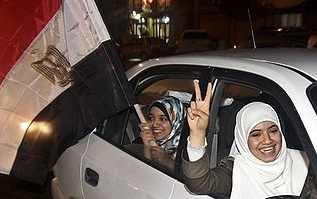 The overthrow of President Mubarak should have been anticipated as an inevitable moment of change. Egyptians might be mad, but they are not ready for revolt. Riot police and a public skittish about confronting the government of President Hosni Mubarak led to a failed nationwide strike on Sunday. Activists had hoped that an Internet campaign and text messaging would arouse enough passion to get hundreds of thousands of Egyptians into the streets to protest low wages and spiraling inflation. Instead, they got a whimper. The focal point was to be the big textile plant in the Nile Delta at Mahalla. The plant has come to symbolize labor and public unrest over Mubarak’s policies. But police seized the factory before dawn and prevented thousands of workers from striking. Similar rallies were squelched across the country, including at Tahrir Square in Cairo. About 30 activists were arrested, but the atmosphere was relatively calm. By January 2009, the April 6 movement reported a membership of 70,000 predominantly young and educated Egyptians, most of whom, Wikipedia reports, “had not been politically active before”. The movement focused on “free speech, nepotism in government and the country’s stagnant economy.” These issues were discussed on Facebook. The April 6 movement uses the same symbols as the Otpor! movement from Serbia which is credited with helping “to bring down the regime of Slobodan Milošević and whose tactics were later used in Ukraine and Georgia.” In a further gesture of pragmatic solidarity, Otpor provided on the ground training for the April 6 movement. The movement used Facebook to demand that imprisoned journalists be released. It also used Facebook to protest Israel’s invasion of Gaza in 2008–2009. The April 6 movement emerged from this early failure. It was this movement that generated much of the power behind the recent overthrow of Mubarak. Asmaa Mahfouz, 26, a young Egyptian activist, who is widely credited with the founding of the April 6 Youth Movement, rallied Facebook followers with a series of video blogs. Three weeks ago today, 26-year-old Egyptian activist Asmaa Mahfouz posted a video online urging people to protest the “corrupt government” of Hosni Mubarak by rallying in Tahrir Square on January 25. Her moving call ultimately helped inspire Egypt’s uprising. “I, a girl, am going down to Tahrir Square, and I will stand alone. And I’ll hold up a banner. Perhaps people will show some honor,” Mahfouz said. The Obama White House was not ready for this change because its major players viewed Egypt from an Israeli perspective. They were not paying attention to Asmaa Mahfouz. Helen Cobban was paying attention. The campaign against anyone with regional expertise– the so-called “State Department Arabists”– was launched in the public sphere by the dreadful know-nothing Robert Kaplan . . . . It got a strong foothold throughout the federal bureaucracy– and far more broadly than in just the State department– with the arrival of President Clinton in 1993. Clinton, that is, who brought along as his key advisers on the affairs of the whole region the two long-time pro-Israel activists Dennis Ross and Martin Indyk! Then, of course, under [George W Bush], we had Elliott Abrams and rest of the neocons running regional affairs for the government. . . .
No one, in short, who can integrate into the advice the President desperately needs to hear any real understanding of how the peoples of the region think and how the regional system actually works. God save us all from their self-inflicted ignorance. The Kaplan book Cobban cites is Arabists: The Romance of an American Elite. When I first read Kaplan, I recall appreciating the fact that someone took seriously the Protestant missionary endeavor in the region. But as you proceed through the book it becomes apparent that Kaplan, then and now a columnist for The Atlantic, was describing the Christian concern for Arabs as naive and detrimental to the new Jewish state. He was wrong, of course. The Christian missionaries were not naive. They were evangelical and idealist. Once they realized that the Muslim population had its own well established religion, the Protestants switched over to education and health. Many children and grandchildren of those original missionaries did, indeed, enter US foreign service because they had a love for, and a concern for, the inhabitants of the region. These “Arabists” soon became influential in the State Department, men and women who knew the history, the language, the religion and the culture of the region. When the state of Israel was created by the UN, it was over the strong objection of the Arabists. They knew a European transplanted state would lead to trouble with Arab neighbors. They were right. Supporters of the new state of Israel quickly moved into positions of political power in the US. Their first task was to reduce the influence of the Arabists in the government. They were very successful. A president who himself is often torn between idealism and pragmatism was navigating the counsel of a traditional foreign policy establishment led by Mrs. Clinton, Mr. Biden and Defense Secretary Robert M. Gates, against that of a next-generation White House staff who worried that the American preoccupation with stability could put a historic president on the wrong side of history. The traditionalists–Clinton, Biden and Gates–may not concur with Israel’s belief that the Muslim Brotherhood is a major threat to Israel, but they are very much aware that it is a fear that drives Israeli leaders. A top priority among the advisors was Israel’s fear that “Islamists”, in this case the Muslim Brotherhood, might assume power in Egypt and abrogate the peace treaty between Israel and Egypt. Israel backers point to Iran as a model to be avoided. The analogy is not a good one. Egypt’s population of 83 million is much more akin to the Turkey model where in recent years a secular government successfully rules a state whose religion is Islamic, while its government is secular. The American media reading of Egypt is so locked into the Israeli narrative that it automatically dismisses a role for the Muslim Brotherhood in a future Egyptian government. President Obama need not depend entirely on his White House team to instruct him on the Brotherhood. He lives close to one of the country’s leading authorities on Muslim-Christian relations, John L. Esposito, Professor of Religion and International Affairs at Georgetown University. Will the departure of Mubarak mean the “threat” of an Islamist takeover, instability and social chaos? Gallup World Poll polling found that while majorities of Egyptian Muslims believe religion is important to their spiritual lives and to progress, they also want greater democratization, freedoms and the rule of law. In fact those in the region were the most likely to say that greater democracy and attachment to spiritual and moral values would contribute to a brighter future. But, does regime change mean a Muslim Brotherhood takeover? Since the late 20th century, far from being advocates of religious extremism, the Muslim Brotherhood like other Islamically-oriented candidates and political parties in Algeria, Tunisia, Morocco, Egypt, Lebanon, Turkey, Jordan, Kuwait, Bahrain, Pakistan, Malaysia, and Indonesia have opted for ballots, not bullets. Among the Brotherhood’s most vigorous critics (and enemies) have been Egyptian militants, including Al-Qaeda’s Ayman al-Zawahiry. For decades the Muslim Brotherhood, though officially illegal, has proven to be the largest and most effective non-violent opposition movement, politically and socially within mainstream Egyptian society. It and other Islamic organizations have provided an effective social service network of schools, medical clinics, and youth camps, an effective alternative an indictment of the government’s inability to deliver. Politically, despite government persistent provocation — harassment, arrest, imprisonment and violence against the Brotherhood, it has remained non-violent. This information is available to the White House, information that would enable him to read Egypt signals correctly and quickly. The AIPAC project to keep the White House an Muslin/Arab-free zone has gone on long enough. This need not continue. Indeed, it must not continue. The picture at the top of two women in Cairo is an AP photo by Adel Hana. As Rashid Khalidi has been saying about the Muslim Brotherhood, “we’ve been sold a bill of goods” that it’s either them or Mubarak, the dictator, because the US needs the Brotherhood to be the boogie man in order to justify supporting a dictator. I threw Kaplan’s book in the trash. BRAVO!!! Splendid writing. Let us hope that someone in the White House knows how to read – or rather, is willing to read something other than the official material cooked up by the Israeli Lobby. And don’t forget the Congress, whose members are almost totally subservient to the Lobby, either from ideological conviction or simple purchase by the Lobby. I was one of those Protestant missionaries back in the 1950’s, early 1960’s that felt America’s MIddle East policy was leaning too much on bullets rather than ballots. When I (along with my family) was evacuated during the uprisings in Lebanon, we were advised not to speak to reporters who had gathered. In fact our government never listened either to missionaries (who knew what was going on) or to their own seasoned diplomats who had lived among the people and knew we were going in the wrong direction. At that time we did not know the full power of AIPAC. Now that is all common knowledge. Will we ever learn? Apparently not, as the military is in our next budget for around 553 billion dollars!! Obama had been pressing for Mubarak to step down; Clinton emphasized stability and all that. I can only hope that the State Dept. sees the writing on the wall and makes a major change in their understanding and approach to Egypt and all the other countries on the edge. At the very least, they SHOULD review their approach to Israeli leaders. I am indeed distressed that our president did not act more decisively in favor of the people of E gypt. I pray that now we will uphold the people’s action which was non-violent and indeed made by their desire for freedom for ALL. The New York Times in its Sunday edition 0n February 12th, 2011 wrote that President Barack Obama described the revolutionary Egyptian uprising “as a model of non-violence and a moral force that bent the arc of history.” The President reportedly went on to compare the 18-days of revolutionary protests to Gandhi’s peaceful resistance to British rule, the fall of the Berlin Wall and student protests that brought down a dictator in Indonesia. In effect, Mr. Mubarak was defeated by a radically new force in Arab politics that was largely secular, a youth-led democracy movement and, most interesting, of all, by nonviolent behavior. These were revolutions of diversity, a proliferation of voices, of youth, of women and men, of workers, as well as the religious. The fact that they were nonviolent in character. it great and good news. Thanks for a great article and for pointing out what prevents the Obama Administration from genuinely understanding the Middle East, particularly as it relates to the Muslim Brotherhood. Obama still has a window of opportunity. The Military Junta that has taken over Egypt is suspect. The US could retrieve a great deal of its credibility in the Arab World by standing firm for democracy, monitored free elections, new constitution, new Parliament, and for switching US aid for the benefit of the Egyptian people, not as bribes for the Egyptian military to maintain Israel’s tyrannical occupation of Palestine. Great and insightful piece. Thank you. Thank you for this informative article. Your analysis seems sound. Jim — I want to add my thanks for your article and also one further note. The thanks is for the history — especially about the arabists and the brotherhood. The note concerns your (and your respondants’) almost exclusive focus on AIPAC as the long and short term cause of White House blindness. I think that focus is true, but I’d agree with respondant Bill Gepford that another more pervasive cause of the blindness is the primarily militarist focus of US foreign policy, something so brilliantly described in Andrew Bacevich’s “Washington Rules.” I’d like to hear more from you on that. We must stop paying Egypt to maintain their part of the Gaza “prison.” Unfortunately, the Egyption military has already stated they will continue their efforts to keep the prison intact. The Obama threat to stop military aid to Egypt was effective, unfortunately, in getting the military to promise their pro-Israel position. One wonders, how long the new leaders in Egypt can maintain this untenable situation.